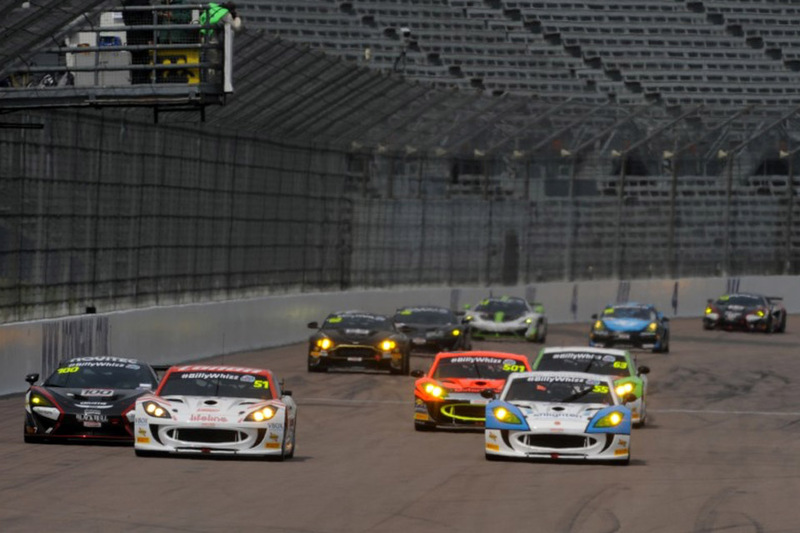 Alex Reed firmed up his bid for the 2017 British GT Championship by taking hard-fought points for sixth from a puzzling race, defined by a success penalty and mismanaged Safety Car at Rockingham Motor Speedway (29-30 April). Having raced to victory in the opening round of 2017 at Oulton Park two weeks ago, Reed and teammate David Pittard carried a 20-second success penalty to Rockingham, only to then be hit with an additional eight-second penalty for being a silver-graded pairing. Hopes of another win or a repeat of the podium achieved at Rockingham in 2016 were understandably low, but the times recorded in free practice and qualifying were a major source of encouragement â€“ the Ginetta drivers had every opportunity to bag a strong finish at the Northamptonshire circuit from the front row of the grid. In the race proper (Sunday 30 April), a sensational start saw Reed sweep past GT4 polesitter Will Tregurtha before the first braking zone at Deene. He used clean air to gap the chasing pack by around three seconds, but an early Safety Car intervention negated his advantage and left him vulnerable at the restart, where he lost two places to the McLaren 570S of Ciaran Haggarty and a resurgent Tregurtha. However, Reed kept a watching brief on the lead battle while managing his tyre wear and adhering to blue flags, before making use of a second neutralisation to re-engage the fight for first. The top five GT4 cars were line astern at the resumption of racing and an admirable attempt to sweep around the outside of second-placed Tregurtha on the banking opened Reed up to an attack from behind. The Horsham-based driver dropped to fifth in the queue as the race entered its final hour and the pit window opened; crucially, the Safety Car wiped out a huge 25-second gap to the car in fifth position just minutes before the driver-changes, when Lanan Racing had to serve a 20-second success penalty, plus an additional eight seconds imposed for fielding two silver-graded drivers. Reed handed the reins to Pittard, who pursued an Aston Martin rival until the Safety Car was deployed for a third time and, in a very curious turn of events, some were allowed to un-lap themselves behind the pace car, leaving Lanan Racing detached and unable to improve on sixth place. Aware that points win prizes and consistency is key to clinching British GT titles, a pragmatic Reed said: "I'm slightly frustrated, but it's pleasing that we brought the car home without damage and scored points for sixth. This, combined with what we achieved at Oulton Park, sets us up suitably for the next round at Snetterton, where I know we will do well." "I was much quicker off the line than those around me, pass Will Tregurtha and pull a gap of around three seconds. Ultimately, the Safety Car screwed up our race. The first intervention diminished my lead over the McLaren, but we really lost out at the second stoppage because we had a huge gap to the car in fifth that would have put us in a strong position after serving our success penalty. Ultimately, we just need to consistently notch up the points if we are to have a shot at the British GT title at the end of the year." The British GT Championship moves on to Snetterton in the Norfolk countryside for Round 4 of the 2017 season on 27-28 May.